In 2000 the European Commission (EC) launched the European Research Area (ERA) initiative, with the intention to improve coordination and collaboration in research and innovation in Europe. ERA became a key element of the ambitious Lisbon strategy in order for the EU “to become the most competitive and dynamic knowledge-based economy in the world” (European Council 2000). The development and the coordination of large-scale research infrastructures have been recognized by the EC as an essential pillar of the ERA. Relevant policy documents prioritized the stocktaking of “material resources and facilities optimized at the European level” (European Commission 2000, p. 10), with the intention to formulate a coherent European approach for research infrastructures. Two years later the European Council established the European Strategy Forum on Research Infrastructures (ESFRI) and mandated it to develop a coherent and strategic approach to policymaking on research infrastructures in Europe. Furthermore, it was asked to compose an inventory of existing research infrastructures of pan-European relevance as a roadmap. The first ESFRI Roadmap for Research Infrastructures was published in 2006 with iterations following in 2008, 2010 and 2016. 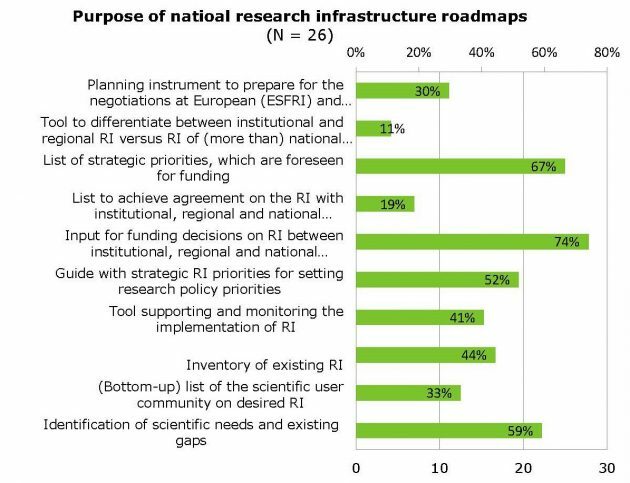 Over time the ESFRI roadmap has been very influential in modernising national research infrastructure policies and planning. Already prior to developments related to ERA, research infrastructures had attracted increased policy attention at international level. In 1992 the countries of the Organization for Economic Cooperation and Development (OECD) established the Megascience Forum (today Global Science Forum GSF), with the mandate to encourage international cooperation and common policy strategies for large-scale research infrastructures. At global scale, it was decided to establish the Group of Senior Officials (GSO) on global Research Infrastructures during the first G8 Science Ministers’ meeting in 2008. Reflecting discussions at EU and OECD level, the GSO is mandated to explore and take stock of cooperation on Global Research Infrastructures. As a result, the first International Conference for Research Infrastructures (ICRI) was organized in 2012 in Denmark to broaden the scope of its European predecessor and include the international bodies GSO and GSF. Although research infrastructures are considered a key component of ERA, the ERA remains fragmented and imbalanced in regard to particular scientific fields and aspirations for world-class research infrastructures. In many countries, strategic priority-setting exercises are taking place or being developed. Procedures depend on the strategic and political objectives of the exercise and on the requirements of the national decision-making processes, including those of national budget regulations. Therefore, the results are very diverse in scope and there is a mismatch between strategic priority-setting exercises for research infrastructures between the European, national and regional levels. As soon as research infrastructures gain a European or global scope, this diversity risks making the funding of construction and operation of research infrastructures across Europe inefficient and not transparent. Thus, it threatens the overall long-term sustainability of the system. InRoad is a coordination and policy support action project funded under Horizon 2020 that aims to support a better alignment of research policies in Europe and hence responds to the challenges described above. InRoad was launched in January 2017 and supports research infrastructure policy development and the exchange of good practices for national research infrastructures roadmap processes and evaluation procedures, in order to promote harmonisation and coordination of national procedures in Europe. The InRoad project executed a first round of data collection through a broad online consultation addressing the actors responsible for the national roadmap process in all EU member states and associated countries represented in ESFRI. The consultation covered all aspects leading to national research infrastructures roadmaps. Twenty-two EU Member States and five Associated Countries responded to the consultation and the results confirmed the large diversity of practices and methodologies among countries in Europe. Some countries are very advanced in the process and have already conducted a series of research infrastructure roadmap exercise, while many others are only starting. 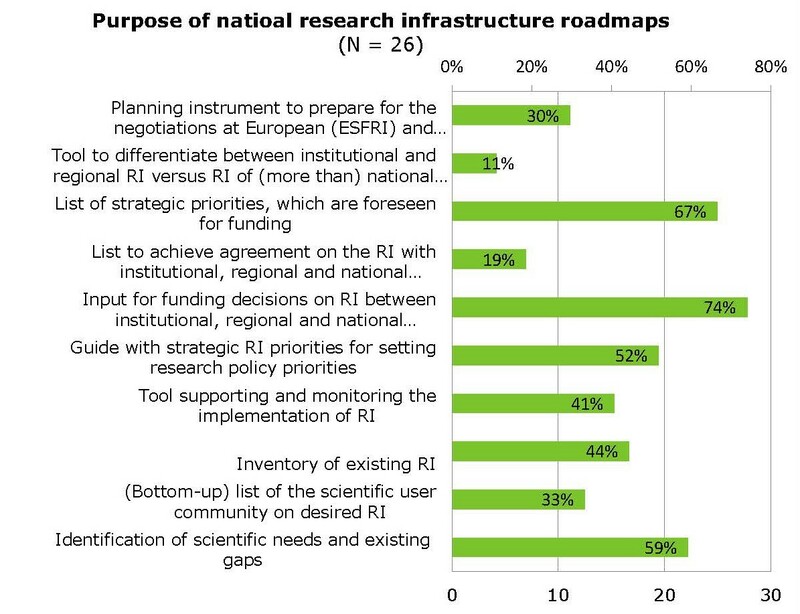 Moreover, the purposes behind national roadmap processes also vary greatly across countries, ranging from identifying scientific gaps to providing a guide to funding decisions (see Graph 1 below). Nevertheless, the consultation also identified some areas of convergence, such as a shared interest in mutual learning and increased collaboration, as well as the importance of sound research infrastructure roadmap processes and evaluation methodologies in a national context. As a next step the InRoad project will execute more in-depth data collection through case studies on the national roadmap processes in specific countries. The following cases were selected: Sweden, Finland, the Netherlands and the Czech Republic. The aim of the case studies is to identify the factors of success in national research infrastructure roadmap processes and lessons to be learned in order to establish in ideal benchmark towards which national processes should converge. The consultation and preliminary literature reviews showed that national decision-making on prioritizing and funding of research infrastructures is very complex, considering the multiple actors and levels involved. This is why the case studies aim first at a thick description of these roadmap processes in order to identify the relevant context. Based on the input of all the relevant actors, including the user community, funders, policy- and decision-makers, the benchmark shall be elaborated. In view of the aim of the InRoad project, an ideal process should allow for better coordination at European level. The InRoad project has the opportunity to present and feed-in preliminary results at several upcoming events this year. The next possibility to meet and exchange with InRoad members will be during the Research Infrastructures Flagship Conference in Sofia (22-23 March), which is hosted by the Bulgarian Presidency of the Council of the EU. Related research will be presented by Isabel Bolliger at the ECPR General Conference 2018 in Hamburg (22-25 August) within the panel „Bringing the politics of international large-scale research into play“. Furthermore, the InRoad project looks forward to welcome interested audience to its sessions at the EuroScience Open Forum ESOF 2018 taking place in Toulouse during 9-14 July, as well as at the International Conference for Research Infrastructures (ICRI) 2018 in Vienna during 12-14 September. Isabel K. Bolliger is a PhD researcher at the Swiss Graduate School for Public Administration (IDHEAP) at the University of Lausanne and interested in Science and technology studies and science communication. In her thesis, Isabel focuses on national decision-making processes for prioritizing and funding of large-scale research infrastructures. As a consortium member of the InRoad project she was responsible for the consultation and the design of the case studies. Dr. Martin Müller is co-heading the Swiss Contact Office for Education, Research and Innovation (SwissCore) in Brussels and coordinating the InRoad project on behalf of the Swiss National Science Foundation. Martin has broad expertise on European research and innovation policy and chairs the Science Europe Working Group on FP9. He is very interested and committed to enhance the efficiency of European research and innovation policy and the interplay between national and European levels as well as between the different stakeholders involved. Martin holds a D.Sc. in biomedical engineering from ETH Zurich. Alexandra Griffiths is currently a Master student at IDHEAP and Trainee for research at SwissCore, as well as Project Administrator for InRoad. As such, Alexandra is participating in the case study research within the InRoad project. Additionally, she is writing her Master thesis on research infrastructure roadmap processes, in relation to broader trends of science and research policy in Europe. European Council (2000): Presidency Conclusions. Lisbon European Council, 23 and 24 March 2000 (Council of the European Union, Brussels). European Commission (2000): Communication from the Commission to the European Parliament, the council, the European Economic and Social Committee and the Committee of the Regions. Towards a European research area. This entry was posted in Global & International, Politics & Public Policy, Publications & Events, Science & Technology, The EU and tagged Big Science, Europe 2020, Europe of Knowledge, European Research Area, Framework Programme, Horizon 2020, international collaboration, research collaboration, Research funding, research infrastructure, research policy. Bookmark the permalink. Next: Science diplomacy – a catch-all concept in public policy?